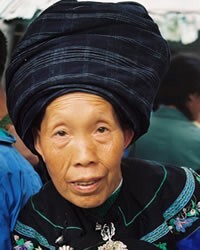 Overview: The Eastern Xiangxi Miao of China, numbering 127,000, are Unengaged and Unreached. They are part of the Miao / Hmong people cluster within the Southeast Asian Peoples affinity bloc. This people group is only found in China. Their primary language is Eastern Xiangxi Miao. The primary religion practiced by the Eastern Xiangxi Miao is Chinese folk religion, a complex mix of beliefs and practices that includes elements of Buddhism, Taoism and ancestor veneration.